I’m giving in! And starting a blog. I have to say I have resisted for a number of years, convinced that blogs are pretty self-focused. But I guess that most people just stop reading the real narcissistic blogs… So if I find that no one’s checking in to the Takameter after a time… I’ll know more about myself. Yesterday, Eric took our partners Peter and Wendi and their 4 children to the airport, as they are flying back to the US for a three month home assignment. Already Sanda feels lonely without them. I have felt strongly the need this summer to pray for God’s protection on them. Please pray with me for these friends who will be covering a lot of ground. This week has been a notable week for Olivia, our one year old. Last night Eric heard her say her first word (besides mommy and ba-ba, or daddy)… and I heard it myself today. 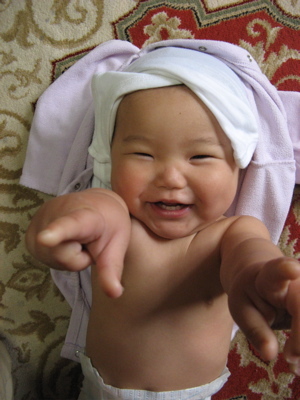 Her first real word is “pocha pocha”, the Japanese children’s word for bath. It’s one of her favorite pasttimes… we frequently find her crawling into our shower/bath room and trying her best to get wet. Then, today our friend Yasko was over, and Olivia took 2 steps from her to me with no one holding on! We keep telling her to stop growing- where is our baby?? Owen continues to do well in yochien (Japanese pre-school/kindergarten). He seems to be a friend-maker… today another mom came up to me and said that her son keeps talking about Owen every night, and asked if he come over and play soon. Apparently several moms have heard their sons playing at home saying in English, “Everybody!” — guess who they learned that from? We are already finding that Owen’s school provides a wonderful place to build new relationships… to begin walking with new friends in their places of joy and pain…to care for people and become part of their lives. Yesterday 3 moms and I took our kids to the park after class. (Owen and Annie are in the center). We were sitting eating lunch, and one mom shared with me that her first daughter died as a baby from a heart condition. She would be 8 today. Suddenly my friend N. became more real as she opened up and began sharing layers of her life…. Isn’t this what it’s all about? I love this site. What a great way to share pictures and stories and moments of your life. THanks for doing this and being so good at giving us glimpses into the Takamoto tribe. I love your website! Choice of colors, graphics, etc…just perfect! Owen is the cutest thing I have ever seen in his uniform. 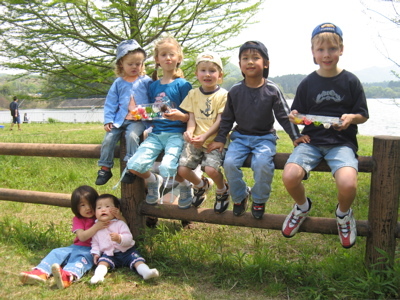 I was looking at him with his Japanese schoolmates and thinking “I’m glad he only has one ‘white parent’ so that he looks Japanese and fits in so beautifully visually.” Then I remembered that he is 100% Japanese! Can’t wait for the next updates. Anne P.
I love your blog! I always love reading your writting! I miss you guys soooo much. I can’t imagine how quiet Sanda is right now. God is goign to do good stuff in your ministry in this time. Please hug all your kids for me and tell Owen I am so proud of him. Oh, Sue!! How fun! Rest assured, I will be stalking your blog regularly 🙂 What a great picture of all seven of the kids, and how neat to hear what God is doing through the experience of yochien! He really is faithful, isn’t He? Thinking about you all and praying for you! I love this Nouwen quote! The ministry of presence–to bring peace wherever you are that comes from knowing your identity and security only in Christ. This is what I pray for everyday. This blessed me today! Love your blog, especially the way you live with the people around you. Thanks for the examples of walking the walk you talk (or however that goes…LOL). Your smiles to the elderly lady will warm her heart, it just may take several repetitions. Your goal of glorifying God shows in all you do. Love to you all! I love the Henri Nouwen quote…from what your family tells me and the stories I hear I think this kind of Missional/Incarnational lifestyle is reflected in your ministry, which is awesome! God is glorified in your work and we are encouraged, by your example, to get out of our comfort zones, move beyond our bible studies and love those who God has put into our daily lives. Keep up the great work. Great blog site. Thank you for persevering and sharing the pictures and your lives. Your children are beautiful-happy! That picture of Olivia is AMAZING! 🙂 Miss you guys lots. Is this how I sign up to get updates ?